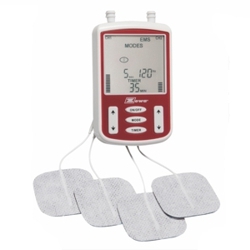 Offers the flexibility to use 2 or 4 electrodes on different body locations. Locks all buttons to avoid accidential setting changes. On Time: 1 - 30 Sec. Off Time: 1 - 60 Sec. Ramp Time: 1 - 30 Sec.